HCRC has been informed that the 'Special Planning Committee' meeting on Thursday 4th April, convened to determine the application for Hampton Court Station application has been cancelled. We understand that Elmbridge has not included the Environment Agency's new Flood-Risk data in its consultation, and is unable to proceed until this has been fully examined. As we hear more details, we will let you know immediately, but a new date for the Committee to meet is unknown at this time. If you have any information to add, please contact me or Tweet us at @HCRCMary https://twitter.com/HCRCMary or visit us on Facebook. We feel certain that our supporters will be staggered to learn that Richmond Boro, which shares its border with Elmbridge on the river Bridge, was not afforded the courtesy of early pre-application consultations about this huge and complex scheme situated just over the Thames. Richmond's comments raise some profound issues. Surrey CC's new Highways layout for Hampton Court is only one example of the apparent lack of collaboration between Local Authorities. The new £2.5M road-designs have already been loudly condemned as worsening the existing congestion on all the major routes upto and over Hampton Court Bridge. HCRC would have expected exchanges between the Boroughs to have been imperative from the earliest stage of these proposals, considering the effects expected to be shared across a very wide area. We understand the EBC Case Office will be progressing her report this week with a view to making her final recommendations available to the Planning Committee. HCRC can only hope that LBRUT's remarks will seriously call into question the advancement of this application and lead to a review of the implications for EBC and Surrey CC. HCRC will be looking into this as the Committee meeting approaches. In the meantime, if you missed seeing the scope of the project, these great youtube/clips perfectly illustrate what Molesey can expect. The images are not impressions, they are lifted intact from the Planning Application. Please open the links to see Elmbridge's legacy for Hampton Court and the Thames riverside. And remember, you are not too late to comment, please take a few moments to make your voice heard. With any other concerns, please do not hesitate to contact us. With our thanks for your continued interest. We welcome your replies to this email address if we can help with anything further, or please don't hesitate to Tweet us at @HCRCMary https://twitter.com/HCRCMary or visit us on Facebook. With our sincere thanks for your continuing help and support. Clearly HE has failed to grasp the monstrous scope of the current plans which add a further 10% to the height of the roof-line in the previous application, consented in 2008. Moreover, an increased footprint adds to its massing, incorporating 97 homes, an 84 bedroom Hotel along with assorted leisure and retail spaces and a small supermarket. With the exception of the grand Palace complex itself, from any other perspective this development dwarfs the surrounding buildings in scale and subsumes the heritage Railway Station. The high-density Villa Blocks are larger than any other building in the Kent Road Conservation Area and the visual impact of walls of brickwork, broken only by glass-box balconies is, in the context of its neighbours, an ill-fitting urban design. Therefore HE's conclusions are shocking and seem completely at odds with the clearest of guidelines expressed in National Policy which serves to ensure that planning consultees are supported in their protection and conservation of the nation's heritage. Moreover, if HE needed further certainty, an enduring Act of Parliament protects the exceptional setting of Hampton Court Palace. EBC's Planning Brief requires that any future development should adhere to the South Western Railways Act of 1913. This prevents buildings on railway land rising higher than 50 feet, within a radius of one and a half miles of the Palace. The consented 2008 plans conformed with the Act, whereas Alexpo's current scheme exceeds this limitation by 5 feet. HRP has examined the impact of Alexpo's scheme on the Palace's historic environment. It has also made recommendations in regard to the consequences of the reduced offer of parking provision at the Station. HCRC completed a thorough assessment of Alexpo's survey on parking and 'street-stress' – and tells the real story of commuter over-spill. A pdf copy is attached in full. Your own comments continue to arrive with EBC with more than 700 hundred eloquent letters of objection filed so far. It was to be expected that the level of public interest in this development would require a longer period of consultation. Bearing in mind the importance and complexity of the Hampton Court Station regeneration and reflecting on the many years of controversy, Elmbridge Council is wisely giving more time for our consideration. The troubled history of previous planning applications cannot be dismissed. The failure of the last developer to deliver on the 2008 project must surely inform how Elmbridge Councillors approach Network Rail's current joint venture. Unfortunately, of the 16 Members sitting on the 'special' Planning Committee on 5th April 19 there is no representation from Councillors with Molesey Wards. Given the high market-values expected from this prestigious development of 97 luxury flats, will 12 units sold as shared-equity help to fulfill Elmbridge's 'Social Housing' obligations across the Borough? In light of the low yield of 'affordable' housing, Elmbridge should commission an independent review of Alexpo's Viability Assessment to reappraise its contribution to the Community Infrastructure Levy. Commercial sensitivity may be restricting the transparency of Alexpo (Isle of Man) Ltd., the offshore company that Network Rail has chosen to partner for this £multi-million project, but with no available pedigree Elmbridge must seek the necessary guarantees that the scheme could actually be realised. e-bulletin: Jan 21st 2019: ALEXPO'S SCHEME ... WHAT ARE THE COSTS? Elmbridge Planning Dept. has been recording resounding opposition to the new plans for the development of Hampton Court Station and the riverside. The comments are arriving from a wide field. Residents living in the immediate areas and those in neighbouring Boroughs have been expressing a variety of critical views of the scheme. This is no surprise as interest has never waned in trying to secure the right future for this very sensitive and controversial site, whose deterioration is a frustration and disgrace. Whilst Alexpo's public exhibition in June showed us the glossy versions of its new scheme, Molesey has been here before. Once again, it has been necessary for HCRC to fact-check some of the claims made and to breakdown the issues important to us all. The busy travel hub of today will get a new highways plan, which will introduce a number of radical changes. The new layout has been designed to make way for Alexpo's development and aspires to improve traffic management. Broadly - a series of multi-way, sequenced Traffic Signals will be installed, the existing Gyratory will be removed and 'KEEP CLEAR' road markings to hold back traffic at the Creek Road junction. Traffic signals will be installed on Hampton Court Bridge to allow vehicles to exit/enter the new development and Station car park safely. A crossroads will be created here to give the option of right, left turns or onward entry into Riverbank. Travellers of all modes who know the area and use the Trunk Roads that feed into the Thames-crossing, will certainly have their own views as to the quality of these changes. Alexpo's scheme for 97 market-value homes and a 84 bedroom Hotel, offers Elmbridge 12 'affordable' units set aside as 'shared equity'. Elmbridge Borough’s policy for affordable housing is principally set out in the Core Strategy (2011) Policy CS21. The Strategy establishes that developments of 15 or more units will be required to provide at least 40% affordable housing, determined by the particular circumstances and the characteristics of the development, including financial viability. However, Alexpo's 'Viability Statement' draws its comparison from the 7 units that EBC Officers accepted in the 2008/1600 extant plans, but Councillors will remember that the prestigious Royal Star and Garter Home was at the heart of that scheme. The favoured social and charitable status of the RS&AMP;GH was taken into account when EBC “reluctantly” accepted the unusually low number of 7 out of Gladedale's 66 units. No such charitable element is suggested in Alexpo's current proposals to off-set the low figure of 12% and it is also clear that this type of intensive development is not the optimum needed to meet Elmbridge's social-housing demand. The project for the comprehensive redevelopment of the Hampton Court Station and the 'Boatman' site is sizeable, with a build cost alone estimated to be £54,407,000. Sensitive to the history of the site and recalling that its last developer failed to proceed with the scheme after approval in 2008, it should be obvious to EBC that a new owner's financial standing should be independently verified. HCRC would strongly recommend that before entering into a future agreement, Elmbridge Officers must seek guarantees that Alexpo (Isle of Man) Ltd., an offshore shell company, is fully transparent and complies with Anti-Money Laundering legislation. A number of design issues have emerged in the Architect's drawings submitted to EBC for the multi-level Car Park. In particular the configuration of the Car-Park ramps which independently service the Lower Ground Floor and the Basement floor. As they stand, the designs may lead to driver-confusion, may reduce safety and further complicate traffic-fluency on and off the site. HCRC has alerted the developer to these concerns and awaits the answers. The development's car parking provision will be inadequate. Disregarding Alexpo's picture of Car Park usage, our number-crunching tells a different story. Of the 207 spaces the developer advertises, scrutiny reveals that only 169 of the spaces are 'unrestricted' and available-to-all. * That number must accommodate the parking needs of rail-users, visitors, the population of 97 flats and the guests of the 84 bedroom Hotel. Not forgetting the combined staff and customers of the Retail/Leisure units and the Supermarket. This are 36 fewer spaces than those operating in the Station car park today - and that is ahead of adding the Alexpo development. Alexpo claims that the records taken in the car park at different times of the year have informed future provision. However, as we all know well, the unoccupied spaces are more likely to reflect the high cost of parking at the Station, which has led quite naturally to the constant use of Molesey streets, free of tariff. *Allocated spaces are restricted for Blue-Badge Holders, Electrically-charged and height restricted vehicles. 18 spaces are allocated for 'Blue Badge' holders - of which the 9 on the Lower Ground Floor, 3 assigned for High (Badge) vehicles and 4 for Electric (Badge) vehicles. Only 2 are unrestricted Badge spaces. The other 9 spaces are in the Basement floor. 8 are unrestricted Badge spaces, one space number however is sited out of range of a 'Disabled'-ready lift, through an un-widened door. In terms of health and safety, HCRC questions why these spaces are located on the Basement Floor? There are 16 spaces for Electric vehicles/chargers, of which 4 as mentioned above are for Blue Badge use. HCRC must strongly emphasise that the height of the new scheme exceeds that of the old Gladedale design. We understand that the developer's starting point was the financial unviability of Gladedale's double-storey underground car park and the need to explore alternatives. The replacement design places all of the parking in a basement floor and an under-croft. This translates to Alexpo raising the residential base-line to a higher level, above which the residential elements of the scheme are then constructed. The density of the development has also increased. The space taken in 2008 for the RS&AMP;G Care Home has been replaced with residential units, 97 in total. The Hotel too, on Hampton Court way, has increased its number of bedrooms to 84, with the building itself occupying a larger footprint than in 2008 to its southernmost end. HCRC has been unable to uncover any details of the improvements to the Railway Station. The details of Network Rail's preparedness for its repair are unknown at this time and are not referred to in any proposal of the Planning Application. HCRC will update supporters when NR decide to publish its intentions. Finally, we are not ignoring the importance of matters surrounding heritage, history or the River setting, but interest in these issues has been fully demonstrated previously. This bulletin is chiefly to see beyond the alluring promotional material that Alexpo has and continues to widely advance. With our thanks for your support and please do not hesitate to email if you require anything further. We welcome your replies to this email address if we can help with anything further, or please don't hesitate to Tweet us at @HCRCMary https://twitter.com/HCRCMary or chat with supporters on Facebook Hampton Court Rescue Campaign. From now until 8th February 2018, the scheme will be open for your comments, either directly using the portal provided, or by email to tplan@elmbridge.gov.uk. HCRC will provide more analysis in the coming days, but we would encourage supporters to view the plans at the earliest opportunity, giving special consideration to three key issues that will without doubt impact Molesey, Hampton Court and the wider Borough in terms of parking, congestion and build-heights. The plans will add 97 new homes - an 84 bedroom Hotel - leisure and retail units, but provide ONLY 2 additional parking spaces to the present Station Car Park. 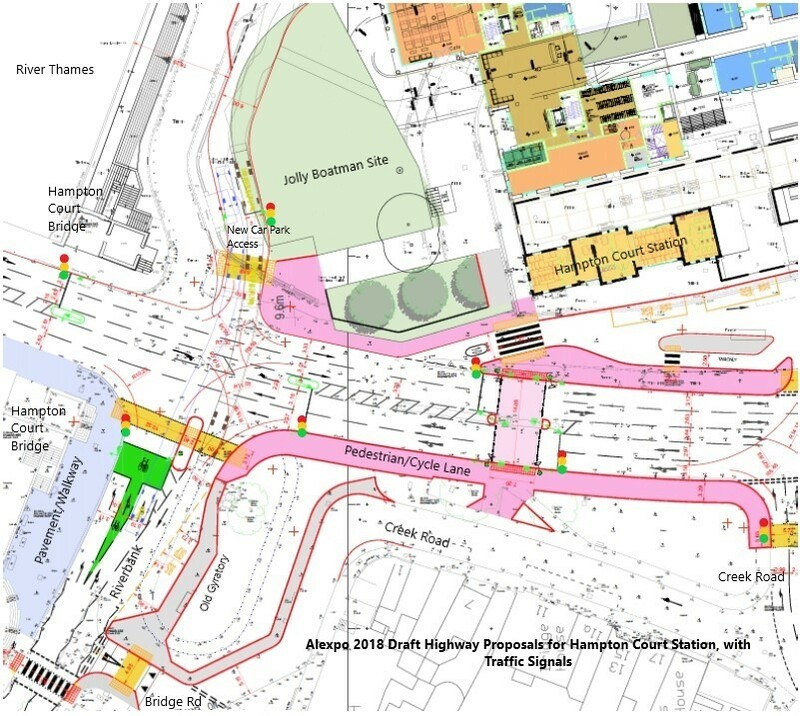 The new Highways layout introduces multi-way Traffic signals starting on Hampton Court Bridge, and relocates the current green Gyratory. The height and density of the new development exceeds still further that of the controversial 2008 plan, dwarfing the Railway Station. Over a decade on, HCRC continues to enjoy the collaboration and the shared objectives of Hampton Court Palace, Molesey residents, interest groups and National bodies who together support the sensitive development of the 'Boatman' site and Hampton Court Station, bringing benefits to all. Alexpo's new scheme may fall short, or even worsen any chance of satisfying any of these aims. In June, Alexpo's public exhibition gave us an opportunity to see the anticipated new plans for Hampton Court Station and the riverside 'Boatman' site. Visitors were encouraged to make comments and believed that their views would be taken into account. We understood from the Alexpo team that a formal Planning Application would be worked-up and lodged in Autumn, 2018. Alexpo's new plans were presented as having improved upon Gladedale's resoundingly criticised 2008 permitted scheme. Alexpo engaged with HCRC's primary objective to remove the Hotel from the riverside, thereby maintaining the 'Boatman' site as a Thames-side open space. With this shared aspiration, both HCRC and Historic Royal Palaces genuinely welcomed Alexpo's appreciation of the area being of outstanding national and European importance, to be treated with sensitivity. However, whilst agreeing to relocate the Hotel, Alexpo has also maximised the scope of development on the remainder of the Station site, which is regrettable. HCRC has had discussions with all the key players over the summer and has thoroughly explored some tricky features that have emerged within the new scheme. Standing above all others, three key issues pose the most serious concerns: there will be too few car parking spaces, the new road layout will increase congestion and the buildings have increased in height and density. Too few car parking spaces. HCRC contends that Alexpo's provision of only 2 additional parking spaces that must accommodate the demands of the existing shared-use, plus the development’s new resident and Hotel population - is completely unacceptable. Commuters using Molesey's Streets for free-parking have increased year-on-year. Further displacement of cars due to Alexpo’s inadequate future parking provision at the Station, will significantly add to this problem and cause more local frustration and inconvenience. Parking restrictions (at the very least) must be considered. 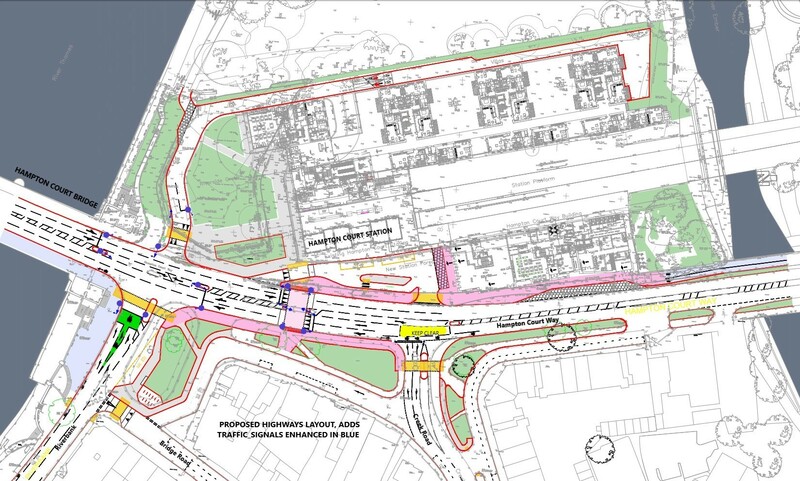 HCRC and other resident groups share a widely held aspiration to improve road-safety and transport efficiency at this very complex junction at Hampton Court Station. The 2008 road plans, originally devised by Watermans, were adopted again as part of the Alexpo scheme and these same plans were shown to us at the exhibition for re-examination. Joining many others, HCRC's highly critical response to these flawed Waterman plans was repeated for the Alexpo scheme. Perhaps in the light of negative responses, fresh design changes to the Highway-layout have emerged over the summer. The new proposals will include the wholesale installation of sequenced Traffic Signalling. Alexpo's own detailed layouts are not available, but the changes have been explained to us in direct discussions with the Alexpo team, who have given assurances that Surrey Highways has agreed to these plans in principle. HCRC however, believes that the new arrangement is very troubling. The illustration below is Alexpo's latest published plan (see www.hamptoncourtconsultation.co.uk). The plan is of extremely low visual quality and HCRC has therefore taken the liberty to overlay the signals, street names and landmarks etc., simply to help orientate the picture and aid clarity. There are many elements of the amended Highway layout that must be professionally modelled and independently tested. It is obvious that the new access to/from the Station Car Park will add to the already slow and congested traffic-flow, specifically a permitted right-turn-exit onto the Bridge. This one manoeuvre imposes the installation of traffic-signals on the Grade 2 listed Lutyens Bridge. These will be sequenced and connected with new signalling at Riverbank, Creek Road, the main Trunk Road and the Station. Furthermore, and not shown on Alexpo's screen-sized drawing, is a proposed 'yellow-box' junction placed outside the Petrol Station to hold-back traffic for Buses leaving the Station. This will undoubtedly stall the progress of traffic on the main road. Local residents who know the Hampton Court Bridge hub will easily grasp the impact of Alexpo's new proposals. A series of Traffic-lights will inevitably slow-up the busy bottle-neck and further impact traffic-flow, congestion and air-pollution at the Bridge Junction and on the roads beyond. Waterman's plan is without merit and uses 'a sledgehammer to crack a nut'. When the Planning Application is finally tabled, HCRC will be submitting its full and comprehensive observations. We assume that the neighbouring Boroughs of Richmond, Spelthorne and Kingston will be responding to the consultation with similar concerns. Addressing the issues laid out above will be challenging enough, but HCRC must add the increased height of Alexpo's new proposals to this list of concerns. The impact on Hampton Court Palace from the height and density of any development have featured strongly in the countless objections to the 2008 scheme. So it is very alarming to report that the roof-line of Alexpo's development will be still higher than the uppermost top-line of the 2008 plans. HCRC has fought for over a decade to preserve the setting of the Palace and to retain the architectural scale of the Victorian Station. It has always been difficult to visualise the imposition of the 2008 scheme on the Station buildings and more now that Alexpo will exceed the permitted scheme in height/density. Alexpo's promotional material (see www.hamptoncourtconsultation.co.uk) does not show any relevant elevations, excepting the Gladedale/Alexpo comparison, shown above. However, material to the guidance in Elmbridge's Planning Policy is the Railways Act governing Hampton Court Station's height constraints. HCRC and other local groups will be exploring the application in this context. HCRC is prepared and supporters await the formal submission of Alexpo's Planning Application to Elmbridge’s Planning Authority. As we go forward, we would like to again thank; Historic Royal Palaces, our Borough and Ward Councillors, the Molesey Residents Assoc. and many other local interest groups who accord with the delivery of a fitting development for Hampton Court Station, the Thames riverside and Hampton Court Palace. Our Committee is profoundly grateful for their time and helpful collaboration. 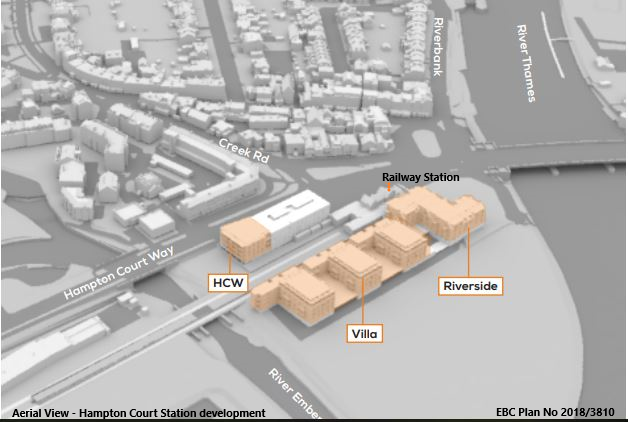 In June, Alexpo offered the HCRC Committee the opportunity to comment on its brand new plans for the redevelopment of Hampton Court Station and 'Boatman' sites. We widely circulated our initial assessment at the time, but have since been able to test the proposals more carefully and submit our proper response. In addition, HCRC has had discussions with the Elmbridge Council Leader, SCC and Ward Councillors to get perspective of the new development's impact on community issues. Combining the views of interest groups with feedback from residents and supporters we are now able to circulate HCRC's formal, wide-ranging response to the proposals. Consulting with the relevant groups and authorities, Alexpo expects to table its planning application in the Autumn. HCRC is pleased to have been allowed to make a meaningful contribution to this process. HCRC hopes that everyone will have a say before Alexpo's final plans are put before the Planning Dept. in the Autumn. We would therefore be very grateful to hear your opinion on this project, and a copy returned to us using this email address would be much appreciated. On Wednesday, the HCRC Committee was invited to attend a special preview for interested parties of the new development proposals for Hampton Court Station and the 'Jolly Boatman' sites. The consultations aimed to provide the developer with preliminary feedback on the new scheme prior to a full planning application in the autumn. HCRC has welcomed the open and constructive dialogue with the developer and believes these proposals could be a step forward from the ruination that Gladedale's 2008 planning consent would have caused to Molesey, its heritage and the setting of Hampton Court Palace. To realistically assess this scheme we recommend that the developer provides vertical elevations of the scheme from the river Thames etc., together with realistic computer-generated renders and impressions of the key vistas. We understand that detailed drawings will be published online to enable all parties to assess the scheme. We will make them available to you as soon as we are able, following which HCRC will provide a formal response to the developer and interested parties. With our thanks for your continued interest and your views will be much appreciated. The public has been invited to an exhibition of new plans for the site on Thursday 21 June, when you can drop in anytime between 2:30pm and 8:00pm and Friday 22 June when you can drop in anytime between 10:00am and 2:00pm. Both sessions of the exhibition will be held at the Thames Motor Yacht Club, The Green, Hampton Court, Surrey KT8 9BW.